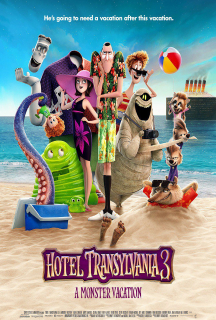 MOVIE SYNOPSIS: Mavis surprises Dracula with a family voyage on a luxury Monster Cruise Ship so he can take a vacation from providing everyone else's vacation at the hotel. The rest of Drac's Pack cannot resist going along. But once they leave port, romance arises when Dracula meets the mysterious ship Captain, Ericka. Now it's Mavis' turn to play the overprotective parent, keeping her dad and Ericka apart. Little do they know that his "too good to be true" love interest is actually a descendant of Abraham Van Helsing, ancient nemesis to Dracula and all other monsters.